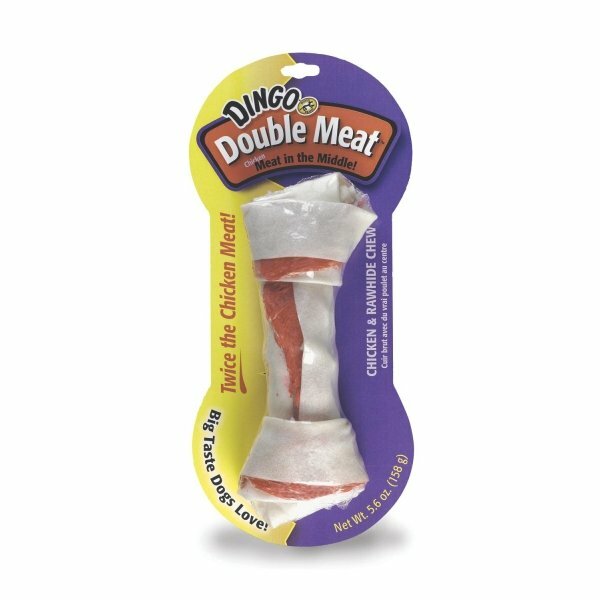 Dingo Double Meat Bone has different options and/or variations, please choose below. Small: 3.5 inches - Dogs under 15 lbs. Medium: 5.5 inches - 15 -30 lbs. Small: 8 inches - Dogs over 30 lbs. Rawhide, Chicken, Water, Natural Color, Corn Sugar, Salt, Potassium Sorbate (a Preservative). Premium hand-tied rawhide bone with the irresistible combination of real chicken breast jerky.